Anthem is a family-oriented community offering life in abundance for people of all ages and interests. It is a place to live, play, work and do business. 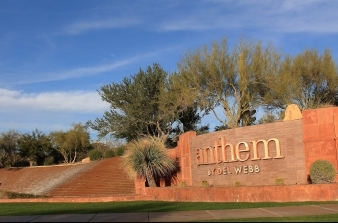 Located at the foot of Daisy Mountain, approximately five miles north of Carefree Highway off Interstate 17, Anthem is a master-planned community that provides all the amenities, services, and conveniences of a big city, yet offers the serenity and charm of a small town. Among Anthem’s amenities includes a 63-acre Community Park and a 40,000 sq.ft. Community Center with an eight-lane Lap Pool, Diving Well and Water Park.